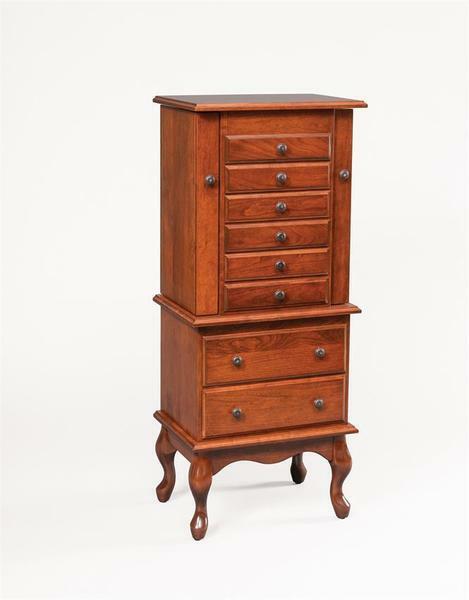 Place your jewelry and clothes in this exquisite Queen Anne Jewelry Armoire that is handcrafted by the Amish. Proudly made in the USA, you will not regret purchasing this Solid Wood Jewelry Armoire. Choose to have this handcrafted in the traditional looking cherry wood or select from our various other hardwood options. We also offer a wide variety of stain and paint options to complete the look. After an order is placed we will send out finish samples to confirm your selection. This Queen Anne Armoire ships fully assembled and ready to use! This is a perfect gift item for birthdays, anniversaries or holidays. Please allow time for this item to be custom made so order early!